Playing board games and card games allows students to practice a number of skills including problem solving, memory, social-emotional learning, reading, and math. Sadly, there are some popular games that seem designed to frustrate students with ADHD, dyslexia, or other learning differences. (For a refresher on games that are great for kids with learning differences, click here). The games below are almost perfectly designed to focus on the challenging areas often associated with dyslexia, ADHD, or executive function issues. When playing these games in or out of school, you may be setting your students up for failure or embarrassment. The Anagram game that will drive you bananas. The award-winning word game that needs no pencil, paper, or board. Fast and fun. Players race against each other to build crossword grids and use all their letter tiles first. 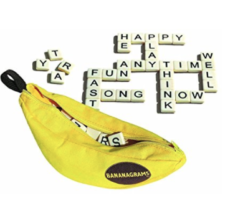 Bananagrams, like many games on this list, focuses on spelling skills, making it particularly difficult for students with dyslexia or working memory issues. 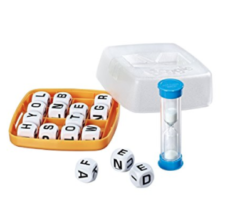 This game is particularly insidious because it requires the student to spell words correctly under time pressure, and if ANY words are misspelled, the student loses all her points. Full disclosure: I have never been able to score one point in any game of Bananagrams. As you can imagine, this is incredibly frustrating. Earn points by spotting words your friends don’t before time runs out. Players have 90 seconds to write down as many words as they can find on the grid before time is up. At the end of the round, score the words. If two or more players find the same word, that word doesn’t count. The player with the highest score wins. I remember despising this game as a kid! I can still feel the anxiety of the timer slowly running out as I am trying to decide if I am spelling words correctly or just making them up. Boggle is so difficult because you need to spell words correctly backwards, forwards, or upside down, which made my dyslexic brain short out. Also, because you only score points by finding funny or unique words that no one else can see, it is much harder to score any points if you have trouble with spelling or reading quickly. Try to make a word including the letters smp. How about ptr. 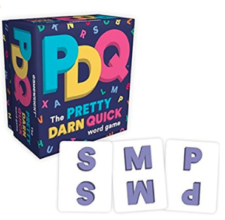 In this lightning fast word game, it’s an all-out race to be the first player to shout out a word using all three cards in play. Each round starts with a different set of letters — it’s up to you to fill in the blanks. Whoever has the most cards at the end of the game is the WNr! Here’s another game where strong spelling skills are required to win. Asking players to spell words quickly using odd combinations of letters requires an impressive working memory and a strong vocabulary, making it especially challenging for students with learning differences. The challenge in WordARound is to quickly figure out where the word starts and to read it aloud before your opponents. Collect cards by being first to correctly read the word written in the designated ring on the card. Anyone who has reading difficulties will find this game maddening. The combination of trying to read letters in the circle while not knowing where to begin, while trying to ignore the non-active rings, can be shockingly difficult for even excellent readers. Each of the above games relies almost entirely on advanced reading skills and working memory. Are there any word-based games that are safe? Yes! 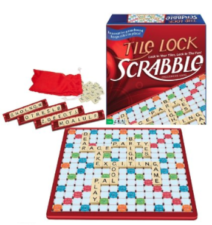 While Scrabble relies on similar reading and vocabulary skills as the games mentioned earlier (meaning it could be very challenging for students with executive function difficulties), it can easily be modified to make it fun for everyone. Unlike Boggle or Bananagrams, it is possible in Scrabble to score a lot of points by using two- and three-letter words. For my students, I like to provide lists of two-letter words, and I allow them to check the spelling of words they want to play. This increases the chances that they will score points, enjoy themselves, and even learn!